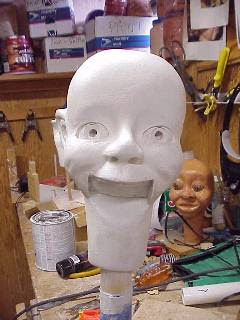 Over a year ago I took on the project of restoring a Frank Marshall Ricky-Tik figure for a ventriloquist client. This particular Ricky had been repainted with clown makeup. The client wanted the clown to look like the little boy looked when the figure was new. You can read the article about that project by clicking here. Ricky-Tiks are small figures. They stand about 36" tall with heads and hands about three-quarters the size of a traditional professional hard figure. The one I restored has fixed eyes. 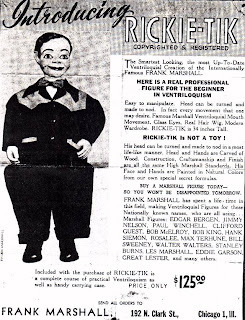 It is the ideal size for young ventriloquists who can be overwhelmed by a full-sized dummy, for professionals to use in walkarounds because of their light weight, and in those situations where very small children might be intimidated by a bigger dummy. Here is a picture of the restored Ricky-Tik. Through an agreement with the client, I made molds of the figure's head and hands with the objective of eventually making a limited number of reproductions. 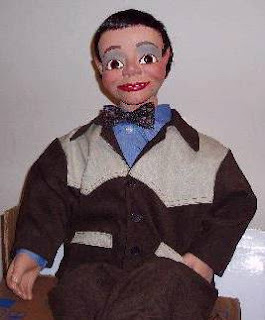 Observe that the restored figure is dressed in a suit based on the style that Marshall used in his advertisements. The client had the suit custom made from the photos so his Ricky-Tik would be authentic. He shared the pattern with me so that I can have copies made. 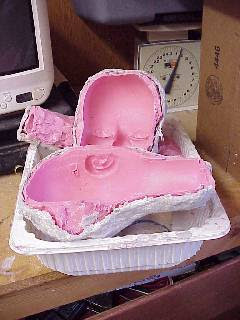 The hand molds suffice for the project, but the head mold does not. 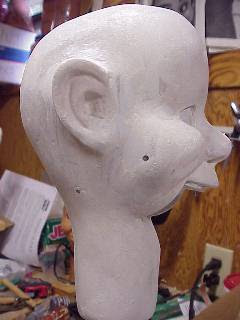 It is a two-part mold that reflects things I had to do to the original head to permit making a mold. For example, you have to tape closed all openings, such as around the eyeballs, the jaw slots, and so on. Otherwise the mold material flows inside those openings and makes a mess. Consequently, the molds show signs of masking tape outlines and do not adequately reflect the eye openings. Also, it is a two-part mold, which means the two halves of a cast must be fit together and the seams filled in and finished. To make it harder, a typical face mold is made with the jaw installed. Which means every cast made from that mold needs its jaw cut out, a jaw casket assembled, teeth and tongue added, axle fitted and aligned, and so on. Using such a mold, a figure maker (me) does a lot of finish work on each cast head to make it useable. I wanted to minimize those repetitious parts of head-making. So I inserted another step into the dummy-making process. I made a finished, working cast of the head with moving jaw and fixed eyes. This cast will never actually be an operational dummy. 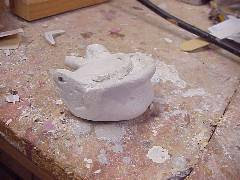 Its purpose is to be a master model for making molds from which I can cast heads that are easier to assemble and finish. After ensuring that the jaw fits and moves precisely, I removed it and closed the jaw opening to accomodate making the mold. Otherwise the head would get filled with mold-making material. Here's the cast master model head. Observe the eyes. They are wooden spheres drilled to accept irises and sealed around the eye holes. The eyeballs themselves will be part of the cast head. I will simply glue the irises into place. This approach saves a lot of time on each head assembly. No eyeholes to cut and finish on the face, no eyeballs to drill and fit into the head. Here's the cast master model in profile. You'll see what seem to be two small holes, one on the cheek and behind and the other below the ear. These were holes when the master model was operational. They hold the jaw axle and jaw control pulley axle. But they aren't holes now. They're filled in from the inside. They are guide holes to show me where to drill holes in the working casts. Here's a picture of the jaw master model. I'll make a mold of it and make multiple casts. It also has guide holes for the axle. Now for what kids call "the beauty part." Assembling a replica is simplified from the usual dummy-making project. I got my inspiration from the Juro headstick Jerry Mahoneys that so many of us used to learn ventriloquism. Everything that goes inside the head is installed through the jaw hole in the face. The headstick is installed through a hole in the bottom of the neck. The headstick has a spring that connects to the post on the back of the jaw to hold the mouth closed. The jaw string feeds up behind the jaw control axle and connects to the bottom rear of the jaw to open the mouth. If everything goes according to plan—that is if it all works the way I hope it will—I'll be able to stamp these dummies out like automobile fenders. I wonder how many I'll really make and whether anyone cares to buy one.